Coconut oil has become more popular for baking in the past year or so. Not only is it a relatively healthy fat, but it is more widely available than ever before, so it is a readily accessible ingredient. It’s easy to work with, since it can be used both as a solid and a liquid, and it can be substituted for either butter or oil. These Coconut Oil Brownies are a great example of how versatile coconut oil can be because they make brownies that have the same chewy, rich texture that you would expect to find in a traditional brownie – without any of the butter. Looking at a batch of these, you wouldn’t know that they were made without butter. They have a dark, fudgy interior and crisp, shiny tops. They have a great texture that balances rich chocolate with just the right amount of chewiness, and they have a lot of chocolate flavor. You will, however, probably detect a very slight coconut note to these brownies. Coconut oil has a very mild coconut flavor – and it can actually vary from brand to brand – and while it is undetectable in some recipes, in recipes with chocolate it seems to stand out a touch more. For me, this isn’t a bad thing because I’m a big coconut fan and I sometimes play it up by adding shredded coconut into batches of brownies, too! 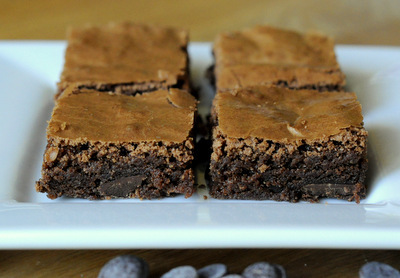 Although they use coconut oil, these brownies are not vegan because they still use eggs. If you want to convert them to a vegan brownie, you can substitute egg replacers for the eggs. 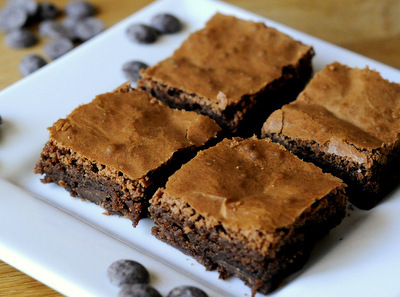 You can also use coconut oil in my gluten free version of this brownie recipe. In a large microwave safe mixing bowl (or a small microwave-safe bowl), melt together coconut oil and dark chocolate in the microwave. This should be done in 30-second intervals, stirring regularly, to avoid overcooking the mixture. Allow mixture to cool slightly. Whisk sugar and cocoa power into coconut oil mixture. Whisk in eggs, one at a time, followed by the salt and vanilla extract. Whisk in the all purpose flour and stir until flour is just incorporated and no streaks remain. Fold in chocolate chips and pour batter into prepared pan. Bake for 30-35 minutes, until a toothpick inserted into the center comes out with only a few moist crumbs attached. Allow brownies to cool completely in the pan, then lift the foil to easily remove them before slicing. 9-inch pan for 30 minutes or 8-inch pan for 35 minute. Look great. I just made “vegan” fudge for some folks using coconut oil. Technically not TRUE vegan because of the honey used. Some vegans would argue that but you could trade out to brown rice syrup or something to avoid that piece. Two folks told me how amazing that fudge was. I could detect the coconut oil but just a hint as you said and it really made the fudge silky in texture. Can’t wait to try these!!!! This might sound dumb, but can you taste the coconut from the oil in the brownies? 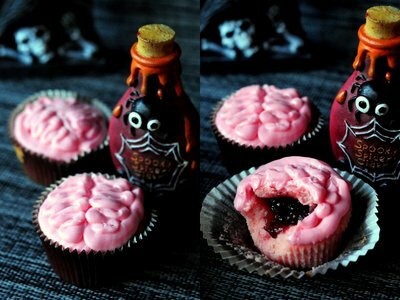 Yummm these look nice. I LOVE using coconut, shredded, flour and oil in cooking and skin care recipes. I LOVE coconut flour and almond flour chocolate torte and am going to make this recipe this weekend with coconut flour to see how it goes. These were absolutely AMAZING!!!! Best brownies I’ve ever had, I kid you not! I’m in love with coconut oil and it just got better! best brownies ever and no butter!